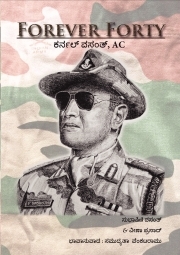 Forever Forty is a celebration of the life of Col Vasanth. A life well lived – from growing up in a loving household and making wonderful friends, to marrying the woman he loved, raising beautiful children, and staying true to his calling till the very end. It is also a celebration of love. Love, expressed eloquently in more than four hundred letters he wrote home while posted on cold, rugged, inhospitable mountains, spending almost every New Year, birthday and anniversary away from family, while keeping intact his characteristic sense of humour, and writing so evocatively as to bring everything alive. These letters are juxtaposed with the stories related by his close friends and family, giving one a glimpse into his amazing personality that is nothing short of inspiring. On 31 July 2007, Vasanth was hit by a bullet while preventing heavily armed militants from crossing over to the Indian side of Kashmir from Pakistan. Though wounded, he continued fighting till the very end. For this supreme sacrifice, he was awarded the Ashoka Chakra – the highest peacetime gallantry award in India. Subhashini Vasanth is an accomplished classical dancer. Apart from performing and teaching Bharatnatyam, she runs the Vasantharatna Foundation for Art, through which she has created a support system for war widows and their children, helping them build a better future for themselves through empowerment and education. Veena Prasad is a creative writer and crossword maker. She writes for children as well as adults, and her writing is woven with elements of compassion and learning. A keen advocate of sustainable living, she believes in minimising her carbon footprint by reducing the trash she generates, reusing and recycling as much as possible, composting kitchen waste and avoiding use of unnecessary plastic.